Water buffalo have been domesticated by humans for 4,500-5,000 years. Domestic water buffalo (Bubalus bubalis), while derived from wild buffalo, are different in appearance and behavior; only wild buffalo are discussed here. Wild water buffalo are massive and barrel-chested, with rather short legs. Males tend to be much larger than females. Both sexes are slate-gray to black in color, although mature males tend to be very dark. The lower legs are pale, but this can be difficult to discern since water buffalo frequently wallow in mud. One or two white crescents are usually present on the throat or upper chest, and there may also be faint pale markings around the eyes, on the sides of the nose, and by the mouth. The ears tend to droop downwards. 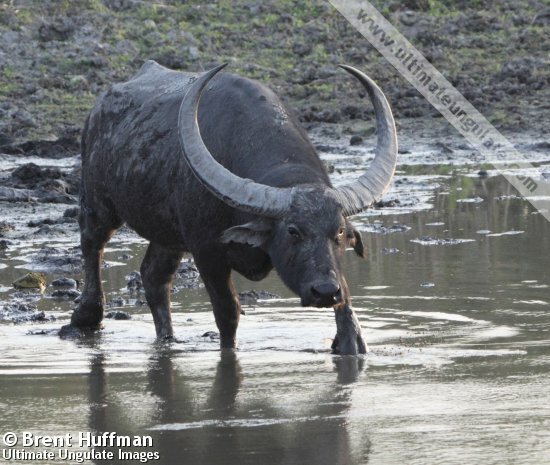 Wild water buffalo are reknowned for their incredible scimitar-shaped horns, which may exceed 120 cm in spread. The horns extend sideways from the skull and curve backwards; in Indian buffalo, the horns often curve in a semicircle, while in buffalo from Thailand and Cambodia the horns spread much more to the side with minimal inward curvature at the tips. Horns of males are thicker, but often shorter, than those of females. 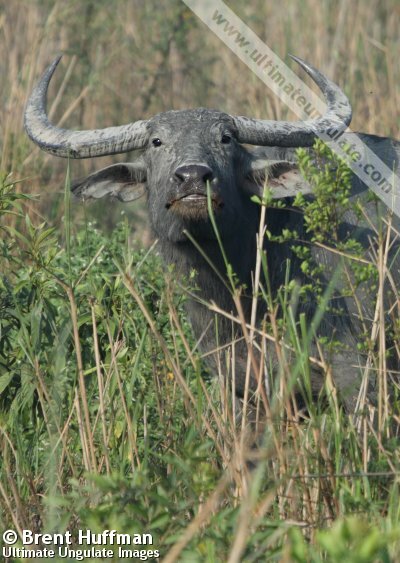 Wild water buffalo are readily distinguished from other wild cattle by their long scimitar-shaped horns. 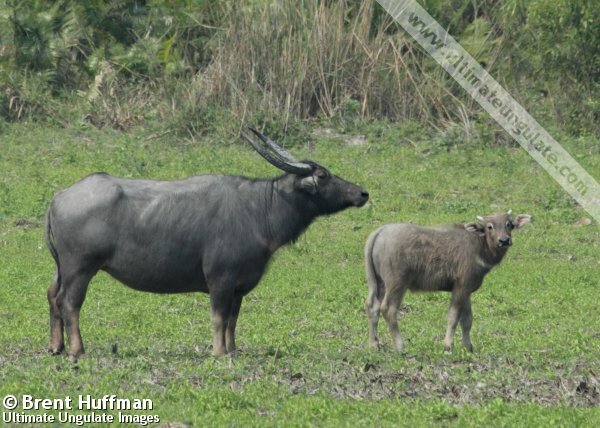 Domestic water buffalo (Bubalus bubalis) tend to be smaller than their wild ancestors and show variation in color: individuals may be dark gray or black, brown, white, or piebald. Horns in domestic buffalo are variable: they often have a tight curl, and, if crescent-shaped, rarely reach the size of wild water buffalo horns. Conflicting reports suggest that wild water buffalo have either a distinct breeding season, an extended rut up to five months long, or year-round reproduction; this may, in part, be attributed to regional differences. Females typically produce one offspring every two years. At birth, the calves are buff-brown in color. They begin to darken around six months of age; females reach their mature adult coloration at two or three years, while males do not become fully dark until after four years of age. Females typically remain in the herd in which they were born, while males disperse in their third year. 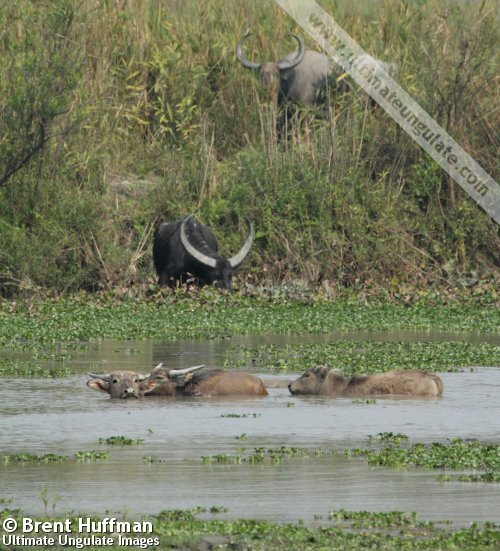 In comparison to their domestic counterparts, little is known about the behavior of wild water buffalo. They may be active both day and night, but a peak in feeding activity usually occurs in the late afternoon and evening. The day is often spent in forests or near pools, which provide relief from midday heat. Wallowing in mud is a frequent activity, especially in summer, as it provides protection from biting insects; the sweeping horns are sometimes used as shovels to increase mud coverage. This species is dependent on water, and home ranges expand and contract based on its seasonal availability. Historical records indicate that long-distance seasonal migrations (covering distances of over 200 km) once occured, although none of the remnant populations undertake such movements. Observations from Nepal suggest that herds occupy stable home ranges. Wild water buffalo travel in single-file, with an adult female in the lead, calves in the middle, and the remaining adults bringing up the rear. Buffalo are extremely protective of their young and females will form a protective line in front of the calves when threatened. If the threat persists, they flee into tall grass or forest and not (despite being strong swimmers) into water. Family group: Females and young live in groups of 10-20 individuals, often attended by a single male. On rare occasion, herds may number up to 100 individuals. Young males often live in small bachelor groups (6-8 animals), while old males tend to be solitary. Diet: Mostly grass; occasionally sedges, saplings, leaves, and crops. Main Predators: Tiger, young may be hunted by leopard. 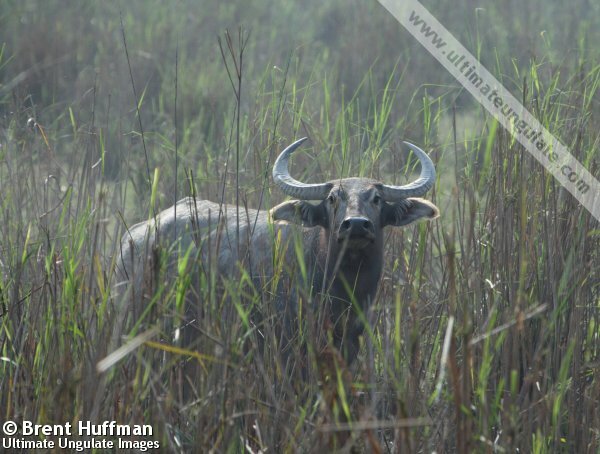 Water buffalo are found principally in grasslands, alluvial plains, and marshes, although they may use woodlands for shelter. Wild buffalo are now restricted to scattered populations in India, Nepal, Bhutan, and Myanmar. 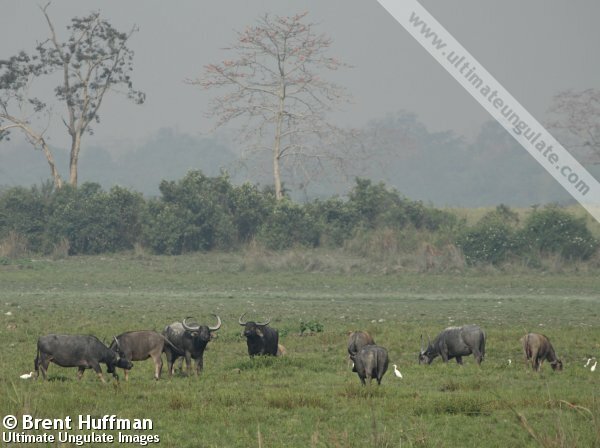 Populations in Thailand, Cambodia, and Sri Lanka are tentatively labeled as wild buffalo, but they may be semi-domesticated. Domestic water buffalo are widespread throughout Asia, and feral populations exist in several other regions including Australia, Argentina, and the Arabian peninsula. 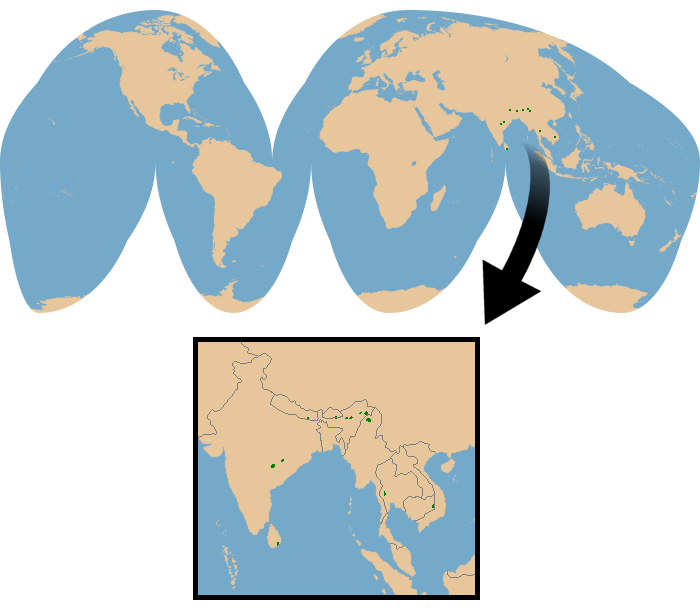 The approximate present distribution of wild buffalo is depicted in the map below. Threats: Habitat loss (especially to rice farming), hybridization with domestic buffalo, hunting, and diseases introduced by livestock. Although wild water buffalo can be locally common where they still persist, the world population is estimated to be fewer than 4,000 individuals and declining. The challenge of differentiating wild buffalo, feral animals, domestic stock, and hybrids makes population surveys challenging. Some authors suggest that there may be no genetically pure wild buffalo remaining, since interbreeding with domestic buffalo is so widespread.